This page lists current activities and projects. epub for Kindle, IPad and now as well in print! This collection focuses on teaching from a wider perspective. This collection focuses on engaging the students and keeping them active. This collection focuses on providing and obtaining feedback. This collection focuses on experiential learning. They focus on what is needed to learn by experimentation and by drawing on the students� own experiences. 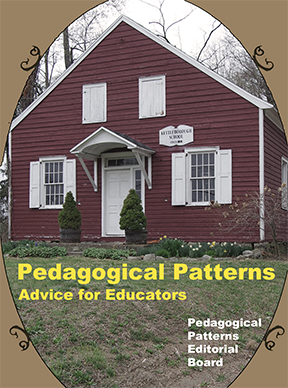 Patterns for Gaining Different Perspectives: This collection consists of patterns that deal with the diversity of instructional techniques. Different leraners learn differently, and so the effective instructor must be able to help students encounter material in different ways. To gain more publicity and to "out" ourselves as PPP participants, Joe is currently designing buttons. Some examples are available. Please give feedback to directly Joe. There are quite a lot of pedagogical pattern of which we feel they should be rewritten to find out the real, essential content. Our goal is to rewrite some of them and create a pattern language for submission at the next EuroPLoP conference. As a result of this work, we have submitted papers to the EuroPLoP and the PLoP conferences. We are still working on this new website. Feedback is welcome. NEW: or more "activity" see our wiki site.